Angkor Preah Vihear is 4754 miles from Giza. This is 19.1% of the great circle circumference, or 68.754° (19.1% times π equals 60.00% and 68.754° times π equals 216.00°). The two great circle segments from the axis point to Giza and to Angkor Vihear are each 90°, or 180° combined. 180°/68.754° = 2.618. The ratio between both sides of this terrestrial triangle and the baselength of the triangle is 2.618 to one. The image below is centered on Angkor Wat and the circle is 1,466.6 miles away. East of Xian, the Longmen caves are close to this alignment. 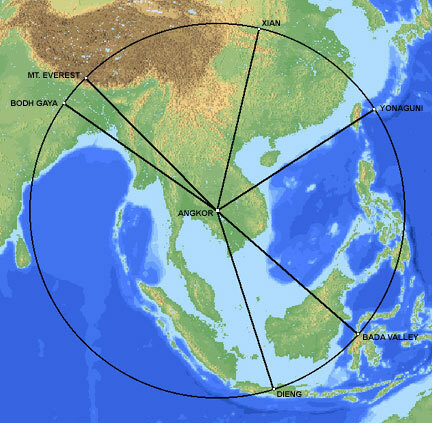 Just south of Dieng, Borobudur and Prambanan are also close to this alignment. Giza is 4,745 miles from Angkor Wat. The midway point along the great circle path from Giza to Angkor Wat is at approximately 26° 15' N 70° 00' E, in the Indus Valley. This is approximately 100 miles east of Mohenjo Daro, closer to the unexcavated Indus Valley city of Ganweriwali. This location is also within one degree of being exactly antipodal to Easter Island. The circle is 2,372.5 miles away from the midpoint in the Indus Valley. 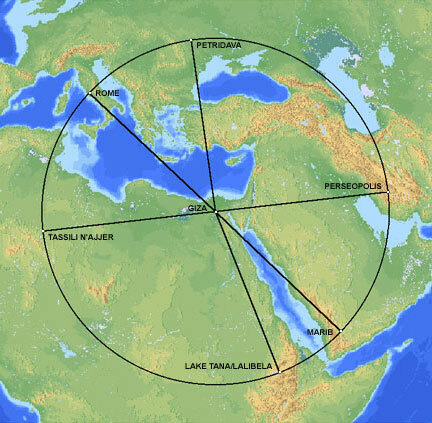 As this alignment follows the course of the Nile in Egypt, it comes close to several ancient Egyptian sites in addition to Giza, including Abydos and Amarna. In Turkey, Catal Hoyuk is just inside this alignment.